Discussion on defining regions for Queensland is in progress. If you know the area pretty well, please share your opinion on the talk page. Queensland  is one of the six states in Australia and most famous because of its association with several major world heritage sites including the Great Barrier Reef, Fraser Island and the Daintree National Park. South East Queensland is one of the fastest-growing areas of Australia, and its capital city Brisbane one of the fastest growing cities in the Asia-Pacific region and offers world-class experiences. With 6,973 km (4,333 mi) of coastline and nearly 2,000 islands to explore, beach tourism is a major attraction for local, domestic and international visitors, exemplified by tourist resort city of the Gold Coast. Along with year-round warm weather and sunshine, this lends itself to a relaxed, laid-back culture and lifestyle that is distinctly Queensland. Further inland, the ancient Gondwana rainforests along the mountainous Great Dividing Range offer a more temperate environment and surprising wildlife encounters. Western Queensland is very arid and offers unique Outback experiences and vast, dramatic landscapes. Queensland's capital and largest city, with a population nearing 2 million it's vibrant but maintains a relaxed atmosphere. A bustling coastal city and holiday playground featuring stunning beaches and exciting Theme Parks. A collection of towns stretching from Noosa to Caloundra are dotted along the coastline with a relaxed yet sophisticated lifestyle. Home to Cairns, Port Douglas and the lush Daintree Rainforest the northern-most region is an ideal base for exploring The Great Barrier Reef. A group of 74 islands off the coast of Airlie Beach float like green jewels in the tropical warm sea. The wide open spaces provide a mix of fun-loving locals, rugged terrain, rodeos & country festivals . On the Tropic of Capricorn this laid back country has diverse natural beauty ranging from beaches to gemfields. Home to the Heritage Listed, world's largest sand island the Fraser Coast if full of natural wonders including world-class whale watching. An inviting blend of secluded beaches, elusive wildlife and rural pastures, Mackay City's streets are lined with Art Deco buildings and palm trees. The regional centre of the tropics blends country and coastal communities. Clean air & defined seasons help the southern region produce wonderful harvests in premiere food & wine country. The southern end of The Great Barrier Reef features pristine beaches and coral islands famous for turtle spotting. Classic Aussie pubs, rural countryside & National Parks nurture unique country experiences. One of the 7 natural wonders of the world it is composed of more than 2,900 reefs and 900 islands which are home to unique coral species and wildlife. Great Barrier Reef – World’s largest living organism and the only one visible from outer space. Stretches over 2,000 kilometres in length and 348,000 square metres (larger than the United Kingdom, Holland and Switzerland combined). Home to tens of thousands of species of brilliantly coloured fish, corals and other marine life including whales, dolphins and turtles. The current conservative government of Queensland is proposing industrial developments that are threatening the vitality of the Reef, so tourists are advised to ensure their destinations are not subject to development. Gondwana Rainforest of Australia – formerly known as the Central Eastern Rainforest Reserves. Located in South East Queensland, is the most extensive areas of subtropical rainforest in the world with large areas of warm temperate rainforest and nearly all of the Antarctic beech cool temperate rainforest. Many of these parks are readily accessible from major towns by sealed or graded gravel roads. The wide range of visitor facilities include kilometres of walking tracks; guided walking and adventure tours and various accommodation options. The rainforests have an extremely high conservation value and provide habitat for more than 200 rare or threatened plant and animal species. Fraser Island – A World Heritage Listed island. The only place on the planet where rainforest grows on sand. Over 120 kilometres long and 30 kilometers across at its widest point. Features wealth of natural attractions including pristine fresh water lakes, champagne pools, amazing coloured sand formations and a shipwreck. Cape York Peninsula - large wilderness areas north from Cairns. Queensland is a large, diverse state stretching over 1,730,648 sq km. Driving distances are long but doable if you plan carefully. There are 12 main highways but the coastal route is scenic and offers plenty of diversions. Queensland is in the UTC+10 timezone. Unlike New South Wales to the south, it doesn't observe daylight saving, so set your watch one hour back when you cross the border during summer. Accredited Visitor Information Centres are available for visitor help and advice when travelling around Queensland. For a list of where to find these centres, Visit Tourism Queensland’s Visitor Information Centres page. Most interstate travelers have the choice of flying to Queensland with Qantas, Virgin Australia  or Jetstar. Flights to major towns are frequent and regional airports are dispersed throughout the state. The main international airports are in Brisbane, Cairns and the Gold Coast. Domestic airports with direct flights from interstate are at Townsville, Mackay, Rockhampton, the Fraser Coast and the Sunshine Coast. Other airports in smaller towns in Queensland are served by indirect flights via one of the airports above. Brisbane Airport is a 15 km or 20 minute drive from the CBD, or about 25 minutes by Airtrain, which also continues on to the Gold Coast. The AirTrain runs every 30 minutes from 6am to 10pm every day and connects to Central station. The domestic terminal is separate from the international terminal, but AirTrain provides a 5-minute connection. There are shuttle buses which provide direct hotel transfers, and plentiful taxis and hirecar providers. Both terminals provide undercover parking for short and long term periods. Brisbane Airport provides a handy map of flight routes and general timetables. Cairns Airport is located 7 kilometers north of the CBD. Domestically, Qantas, Jetstar and Virgin Australia all operate out of Cairns, with scheduled services to most Australian state capitals, as well as regional locations. Cairns also handles international flights from Hong Kong, Singapore, Japan, Papua New Guinea and New Zealand. Rental Cars can be located at the domestic terminal in the QantasLink arrival lounge. Shuttle buses to Cairns and Port Douglas depart hourly. Taxis are also available 24 hours a day, and the fare to the city centre costs around $16. Short-term and long-term parking is located next to the passenger terminal. Gold Coast Airport is located on the Gold Coast Highway at Bilinga (close to Coolangatta) on the southern end of the Gold Coast, and is only minutes from the beach. Part of the runway actually extends into New South Wales. The airport 30 minutes’ drive from Surfers Paradise and an hour from Byron Bay. The drive to Brisbane can take an hour and fifteen minutes. Jetstar, Qantas, Tiger Airways and Virgin Australia all have frequent domestic flights from Adelaide, Melbourne, Canberra and Sydney. Internationally, AirAsia X, Air New Zealand and Freedom Air fly in from New Zealand and Malaysia. Surfside Bus Lines and Gold Coast Tourist Shuttles offer convenient transfers to hotels and theme parks. The free Airport Link shuttle takes you straight to the Gold Coast Highway, where public transport is readily available. Car rental companies can be located opposite the check-in counters at the airport. Taxis are available immediately outside the terminal. There are a number of companies that operate bus services between cities and towns throughout Australia, and there are also interstate trains. Queensland’s wide open spaces make it ideal for exploration by car. The roads are high quality and well-signed so getting here is easy. The drive from Melbourne is ideally covered over two days (minimum), and Sydney to Brisbane can be driven in a day. From Melbourne or Sydney, take the coastal Pacific Highway (1); the more inland New England Highway (15) through New South Wales; or the inland A32 from Adelaide which also goes through New South Wales. Serious outback travelers heading east from the Northern Territory can enter Queensland via Mount Isa on the Barkly Highway (A2); or drive up from South Australia via the Birdsville Track (an old stock route and now a dirt track) and on to Longreach. This journey is recommended in a four-wheel drive vehicle. If backpacking or on a tight budget, check to see if you can double up with other low-budget travellers who may be driving inter-state, or investigate car-hire places that sometimes offer deals charging less to return their stock to capital cities. The Countrylink/XPT service from Sydney is at present the only interstate service. The trip from Sydney to Brisbane takes around 14 hours; the connecting journey from Sydney to Cairns takes a little less than two days if you choose not to break it up along the way. The Brisbane XPT train runs once a day from Sydney’s Central station to Brisbane’s Roma Street. The train departs at 4:20pm in the afternoon, travels overnight and then arrives in Brisbane at 6:30am the following morning. You can also board the train at Strathfield or Hornsby station, at Broadmeadow in Newcastle or at one of stations along the way. You can also travel to Brisbane during the day by catching Countrylink’s Casino XPT train from Sydney Central station to Casino, then changing to a connecting bus. The bus takes you from Casino via the Gold Coast to Brisbane’s Roma Street station. The whole journey takes fifteen and a half hours - of which only the final three hours are on the bus. The train departs Sydney Central station every day at 7:15am in the early morning, and the connecting bus arrives at Brisbane Roma Street station at 10:21pm late that same evening. Interstate and International Cruise Liners regularly dock into Brisbane, and sail on to the Whitsundays, Cape York, Townsville, Cairns and the Great Barrier Reef. Luxury cruises liners that regularly call into Brisbane include P&O Cruises, Carnival and Oceania Cruises. Brisbane’s cruise ship port is called Portside Wharf, a recent development located in Hamilton, 6km from the Brisbane CBD or about a 20 minute drive. Buses into town and ferries service the port regularly. It also houses a fresh produce market, riverside restaurants, cafés and eateries, boutiques and cinemas. Portside Wharf provides a handy shipping schedule. Air travel in Queensland is easy to organize and commute. With international airports in Brisbane, Cairns, Townsville and the Gold Coast, plus many regional and island airports, air travel is an efficient and reliable way to get around. Qantas, Virgin Australia and Jetstar and a number of smaller regional carriers. Traveltrain Holidays[] offers Australia's largest and most comprehensive network of long-distance trains, carrying more than half a million passengers each year. Its premium service, Queenslander Class on The Sunlander, was recently named one of the 'World's Top 25 Trains' and 'Australia's Best Rail Journey' by the Society of International Railway Travellers. The dedicated tourism arm of QR Limited (formerly Queensland Rail), Traveltrain Holidays offers a fleet of long-distance passenger trains connecting Brisbane to a host of holiday destinations throughout Queensland including Cairns, Townsville, the Whitsundays, Charleville and Longreach. Each of Queensland Rail's coastal, outback and tropical north services offer a unique travel experience. Traveltrain Holidays packages its rail experiences with accommodation, fully-guided tours, cruises, flights and car hire. It operates travel centres throughout Queensland as well as a call centre. The Inlander - Townsville to Mount Isa. A 977 km trip, enjoyed in air-conditioned comfort, traveling through Charters Towers across the Great Dividing Range and through Hughenden and Julia Creek before delivering passengers at the mining centre of Mount Isa. The Westlander - Brisbane to Charleville. A scenic journey from Brisbane traveling across the Great Dividing Range and through the rich farmlands of South East Queensland Country before arriving in Charleville, the largest town in the south-west Outback. Tilt Train - the fastest narrow guage trains in the world, the Tilt Trains provide an efficient, comfortable and modern standard of travel. Most of these services depart from Brisbane’s centrally located Transit Centre/Roma Street station. Most of South East Queensland is serviced by buses, trains and ferries on the TransLink network[], which stretches from the southernmost part of the Gold Coast to the northern tips of the Sunshine Coast. Visit TransLink's website[] for timetable information, maps and a helpful Journey Planner to get a wide range of transport options. One TransLink ticket will take you wherever you need to go within the network. In most regional centres, the qconnect initiative[] connects public transport services; including buses, accessible taxis and community and subsidised transport. The site maintains a detailed list of Urban Bus Services  to be found in most regional areas. Great Barrier Reef - One of the seven wonders of the natural world, this magical underwater labyrinth will treat you to spectacular displays of nature found no where else in the world. Stretching from Tropical North Queensland in the north to Capricornia in the south, the rare, ancient beauty of the reef can be enjoyed from many different points of view. On the Whitsundays you can dive amongst the coral on a scuba-diving adventure, or watch the reef come on a purpose-built pontoon. From Townsville you can wonder at its beauty from the comfort of a glass-bottomed boat or view from helicopter joy-flight. On the Southern Great Barrier Reef, off the coast of Mackay and Central Queensland you can go snorkelling in a sheltered coral cay, or keep your clothes dry on a leisurely reef walk. Mossman Gorge - A very accessible and scenic section of the World Heritage-listed Daintree National Park. Strangler figs and epiphytic plants flourish and the crystal-clear Mossman River cascades over granite boulders. The area is also home to colourful Boyd's forest dragons. Stroll along the 400 metre walking track to viewing platforms over the Mossman River. Look for the brilliant blue Ulysses butterfly and birds such as the eastern yellow robin. Take the two kilometre loop track through lush, green rainforest to learn about the plants and find out how the local Kuku Yalanji people use them in traditional ways. Migrating Whales - The coast of Queensland provides visitors first-hand experience to view migrating whales during the winder months. There is various vantage points right downs the coast, but to really get the most for your whale watching experience, jump on board a whale watching tour with one of the many companies. The protective waters of Hervey Bay is the most popular destination to view these gentle giants of the sea. Viewing is generally only throughout July to November. Nesting Sea Turtles - Many varieties of turtles such as the loggerhead, green, leatherback and flatback nest from October to March each year along the Queensland coast from Bundaberg in the south to the Cape in the tropical north as well on the islands of the Southern Great Barrier Reef (Heron, Wilson, Lady Elliot, Lady Musgrave). The Turtle Nesting and Hatching season is an amazing experience and visitors to Queensland will find opportunities to witness these nocturnal events in a controlled environment at a number of island and mainland locations. Near Bundaberg, Mon Repos supports the largest concentration of nesting sea turtles on the east Australian mainland. Viewing is generally only from November to March. You can help conserve turtles by participating in a six-day camp, working alongside the Mapoon Aboriginal owners and researchers as they measure and tag nesting Flat Back and Olive Ridley turtles, fit feral pig exclusion devices to the nesting sites and remove nets from the beach. Viewing is generally only from June to September at Mapoon, Western Cape York. The Magnificent Moreton Bay - the mouth of the Brisbane river, and home to a collection of islands where boating, fishing, sailing, camping, holidays and day-trips make Brisbane such a brilliant out-door adventure city. Take a guided tour around beautiful St Helena Island, a former jail from when Brisbane was a penal colony. Spend the weekend at Stradbroke Island and surf on magnificent beaches or take the kids to Coochie Mudlo Island for a quiet day out on flat water beaches. RiverFire - the last night of the annual River Festival - a night when Brisbane comes out to watch an incredible fireworks display choreographed with precision to spray from the tops of buildings, from the cities bridges and barges stretched all along the river from Southbank to the Story Bridge. The fireworks are kicked off and ended with the dump and burn by the RAAF's F-111 fighters. Wallaman Falls National Park is part of the Wet Tropics World Heritage Area, boasting the highest, permanent, single-drop waterfall in Australia. Open forest dominates the ridge tops. Rainforest lines the gullies and creeks. The area is home to endangered cassowaries and musky rat-kangaroos. Stroll 800 metres along the banks of Stony Creek on the Banggurru walk, and learn about the rainforest. Look for platypus in the creek below the falls. To enjoy a closer look at the falls, take the 3.2 kilometre Jinda walk into the gorge. Experienced bushwalkers can choose from one of three overnight hikes that are part of the Wet Tropics Great Walk. Tamborine Mountain Glow Worm Caves are located at Cedar Creek Estate. The caves consist of two large chambers interlinked by tunnels. The first chamber is the "presentation cave", where you will be shown an audiovisual display on glow-worms and the construction of the caves. This chamber is complete with very realistic formations (speleothems), such as stalagmites and stalactites, water features and flow stone. Undara Lava Tubes - only three and a half hours from Cairns in Tropical North Queensland's Gulf Savannah lies a land so different in contrasts - and the Undara Experience. Undara is a pristine wilderness possessing one of the longest and best preserved lava tubes of its kind anywhere in the world. SS Yongala Wreck - lies within the Great Barrier Reef Marine Park, only 12 nautical miles from Yongala Dive's base at Alva Beach in Queensland. It sank in 1911 with the loss of all aboard, creating one of Australia's most intriguing maritime mysteries as she lay undiscovered for more than half a century. Lying in 14 to 28 metres of water and over 100 metres long it is one of the largest and most intact historic shipwrecks in Australia and provides an exciting adventure for divers due to its coral encrusted structure, the depth and the incredible array of marine life. Atherton Tablelands - the 'capital' of the lovely Tropical Tablelands, a land of beautiful lakes, waterfalls, rich red soil and tropical rainforest. Here the temperature is cooler, the pace is slower and there is a feeling of relaxation in the air. The rich Tableland area is famous for producing peanuts, maize and potatoes. The area also has a number of natural attractions such as the Curtain Fig Tree, Millaa Millaa Falls, crater lakes and amazing rock formations. Atherton is ideally situated as a base to explore most places of interest in the Tablelands area. Australian Age of Dinosaurs - home to the world's largest collection of Australian dinosaur fossils. A working dinosaur museum and research laboratory, they are located on 14,000 hectares of spectacular mesa plateau with vast scenery, wildlife and walking trails. At the museum you'll see and hear about their exciting dinosaurs, including gigantic sauropods and ""Banjo"", Australia's greatest carnivorous dinosaur. Underwater Observatories - There is no need to get your feet wet. Observe all the wonders of Queensland's marine life from behind the glass of an observatory. Queensland is host to a number of underwater observatories including; Reef HQ - the world's largest living coral reef aquarium and national reef education centre for the Great Barrier Reef Marine Park. UnderWater World - a multi-award winning, all weather, tourist attraction located in the heart of the Sunshine Coast. Glass House Mountains National Park was named by Captain Cook as he mapped the Queensland coast in 1770. The 'Glass Houses' are distinctive volcanic plugs which rise abruptly out of a patchwork of farms and forests. The Glass House Mountains are spiritually significant to the local Aboriginal people. The park is made up of several sections that include most of the peaks and forest areas. Drive to the Glass House Mountains lookout for a great view of the multiple peaks. Within the park's sections there are eight walking tracks ranging from 25 minutes to three hours, and catering to all levels of experience. Fit walkers with rockclimbing skills can reach the summits of Mounts Tibrogargan, Ngungun or Beerwah. Suitably equipped experienced rock climbers can climb and abseil Mount Ngungun. See Whitehaven Beach from the air - many commercial airline companies exist that provide flight services over Whitehaven Beach. Enjoy a helicopter flight over Islands and waterways then quality time on a secluded beach in the Whitsunday's and treat yourself with a gourmet picnic hamper and ice-cold champagne. Flight types vary but can include scenic flights to and from the Reef as well as a stop over on Whitehaven Beach, Langford Reef area and a scenic flight over Hook, Hardy's and the famous Heart Reef, then continue near Langford Reef where you can swim and view the breathtaking coral gardens at your leisure with a gourmet champagne picnic hamper. Aboriginal Rock Art - the Art Gallery in the Carnarvon Gorge National Park contains some of the finest Aboriginal rock art in Australia. Just 5.6 kilometres from the trailhead, at the junction of Kamoloo Creek, a signposted access track leaves the main walking trail upstream of crossing number 10, providing a gentle climb to the escarpment base where the site is located. Boardwalks, interpretive signs and seating facilities provide optimum conditions for visitors to appreciate this diverse range of Aboriginal artwork without endangering it. This extensive gallery contains more than 600 stencils and 1300 engravings. Aboriginal rock art on the sandstone overhangs is a fragile reminder of the Aboriginal people who used the gorge for thousands of years for ceremonies and rituals. Q1 Observation Deck - Australia's only beachside observation deck, located in Surfers Paradise on the Gold Coast. QDeck takes you to the highest point above the city, providing stunning 360 degree views from the surf to the hinterland and beyond. Rising 235 metres into the sky, QDeck is located on level 77 of the iconic Q1 tower. Your journey begins with an inside look at the construction of this landmark development before boarding one of the world's fastest express lifts which transports you from ground to level 77 in less than 43 seconds. Once at the top, you will see spectacular views which reach on a clear day from Brisbane to Byron Bay. Adventure - Fly through the air, dive through the coral, or ride the wild river rapids - a Queensland Adventure holiday really gives you something to write home about! With craggy mountain heights to scale, deep limestone caves to delve and vast treks of unchartered Outback to explore, Queensland is a land brimming with surprising discoveries and exciting adventures to enjoy. In Queensland you can learn how to hang glide off a mountain or ride a camel along a golden beach. You can camp by a billabong or feel your adrenalin surge on a real life cattle muster during a farm stay on the Western Downs. From an inflatable jet boat you can watch the whales waltz or take a jet ski eco-safari through the glorious Whitsundays archipelago. Then as the sun sets over the ocean, watch the Reef come alive under the stars, during your overnight stay on a purpose-built ocean pontoon. Treat the whole family to an exhilarating day at a world-class theme park. Feel the rush of the rollercoaster, go behind the scenes of a movie set, and get up close and personal with exotic animals from around the world. Islands and Beaches - Queensland is home to some of the most stunning islands and beaches in the world, and each one invites you to come and share in its sumptuous delights. Set like sparkling jewels in and around the pristine waters of the blue Pacific Ocean, Queensland’s islands and beaches are a true national treasure. On the islands you can treat yourself to a day spa, dive through the Great Barrier Reef, improve your handicap with a round of golf, then, as the sun sets over the water, indulge in fresh, local, mouth-watering food and wine. With sands so clean and white they dazzle the eye, a day spent on a Queensland beach is truly one of life’s greatest pleasures. With palm trees swaying lazily on one side and clear azure waters gently lapping at the other, the siren-call of a Queensland beach is impossible to ignore. Natural Encounters - Watching the sun set over the ocean from the white sands of a deserted tropical beach is truly one of life’s greatest pleasures. Soaking up the view from the crest of a mountain you’ve just scaled is another. And watching dolphins at play in the turquoise waters of a tropical lagoon is a memory you’ll treasure for a lifetime. All these experiences and more are waiting for you in Queensland’s wild natural environments. From the spinifex grasslands of the Outback to the lush rainforests of the Gold Coast Hinterland, Queensland is a nature-lover’s paradise. Breathe in the fresh, clean Queensland air and escape to a world free of phones, emails, meetings and deadlines. In the north, the World Heritage listed Daintree Rainforest yields to pristine sandy beaches and the clear blue waters of the Great Barrier Reef. In the south, majestic mountains stand guard over the rare flora and fauna within its fold. And in all places in between you’ll find rare and exciting animal encounters that will delight the whole family! Relax with the Queensland Lifestyle - Feel your work-day worries melt away as you soak up the warm, welcoming lifestyle of Queensland. Put meetings, deadlines and peak-hour traffic far behind and head to Queensland - where the only decision you’ll have to make is, seafood or steak, white wine or red? Take in the views from the deck of a super yacht. Detoxify the body and de-stress the mind at a luxurious day spa. Visit the markets and bag a bargain or improve your handicap with a round of golf. Ignite your imagination with art, dance, theatre and culture, both home-grown and the finest from overseas. Then hit the casino for a chance to strike it rich! Watch the best in the world compete for a surfing crown, or for sport of a different kind, spend the day shopping at exclusive designer label stores found no where else in Australia. Queensland is host to a large range of events right across the state. Catch The Savannahlander  from Cairns to Forsayth - this unique four day train trip is a great way to see the Australian outback. Brisbane City is not only the gateway to Moreton Bay the Sunshine Coast and the Gold Coast, but is a destination itself. It used to be that travellers would stop in Brisbane because they had too on the way to the rest of their holiday. But these days Brisbane offers world class arts, adventure, fashion, dining, nightlife and daylife. The River City offers river tours, night and day, low-key, touristy, romantic or wild party style from a variety of companies. For a great night out, to see great bands or go to a dance party, locals head to Fortitude Valley in the evening and then enjoy the Valley markets on the weekends in Brunswick mall. West End also has trendy bars and restaurants, with markets on Saturdays along the river where local culture and local farmers sell their wares. For a lower key or a generational difference, try Paddington, Bulimba or New Farm for dining and cafes. Shopping in the city centre is a pleasure with shady pedestrian malls and alfresco cafes and restaurants at every turn. Southbank is the perfect family destination for a low-cost or elegant night out - just pick your style. Fish and chips on the picnic tables provided in the grassy parklands, or fine dining in some of the top class restaurants lining little Stanly street. Come back in the morning for the famous markets on the weekends, and take a swim in the sparkling man-made beach, looking across the river to the cityscape. The free childrens water play park is new and hugely popular. Change rooms and shady spots are available and abundant. Take guided night walks through the Botanical gardens to view the nocturanal wild-life. Go kayaking along the river in daytime or nightime. Climb the story bridge, or the Kangaroo Point cliffs. See live comedy, go to a play or a musical, visit the art gallery where Picasso and Andy Warhol collections were recently shown, or just cycle through the cities purpose built cycle paths that can take you from one end of the city to the other, and stop in the many parks along the way for an ice-cream or a drink. Gold Coast - An hour south of Brisbane you will find world class surfing, beautiful beaches, great food from all cultures, nightlife, fun parks, day trips by plane, helicopter or boat, deep sea fishing, unbelievable shopping, casino, shows, festivals, markets, or just watching the beautiful people. From Surfers Paradise to Cooloongatta the beaches alone are enough. Modern and clean, the southern corner of QLD is a world class holiday destination for people on all budgets. Sunshine Coast - 2 hours north of Brisbane you will find the Sunshine coast with all the Gold Coast has to offer, but with a slightly different demographic (higher propertion of retirees), and a less dense population. The Sunshine Coast stretches across a number of towns each with thier own charms and flavours. The population boom being experienced by the Sunshine coast has much to do with the Sea-change migration from NSW and Victoria, as southern retirees come to spend the rest of their days enjoying what QLDers have had on their doorstep for their whole lives. Fraser Coast - Gateway to Fraser Island the Fraser Coast is experiencing a massive property boom and tourist explosion. Unspoilt beaches and waterways, fantastic 4WD'ing, whale watching and fishing seem to be the main attractions, although the interior has plenty to offer those interested in the agricultural life of QLD. The Town of 1770 - the closest access point to the Great Barrier Reef, north of Brisbane. Just over an hours drive from Bundaberg and Gladstone airports it is a small coastal strip now slowly making itself known to the broader population. Great accommodation deals and quiet holidays can be had in this area where the reef is accessible for inexpensive day trips by boat. Snorkelling, surfing, fishing and camping, holidays houses, cabins or luxury resort accom available. Agriculture is a major industry in Queensland, with different regions specializing in different produce. Famous examples include sugercane in the Whitsundays; peanuts for Kingaroy; mangoes for Bowen. Fresh local fish can also be found right along the coast, usually sold in "Fish & Chips" shops. High quality produce is grown all year round and superior freshness is the norm, not the exception. Brisbane and surrounding areas like the Gold Coast and Sunshine Coast are becoming very well known for quality restaurants, cafes and take-aways. Whether it's 5 star or fast food you are after there is no need to eat poor quality food in Queensland. With so much fresh food available, seek out boutique and independent operations with a focus on quality and freshness. You won't usually pay more than its worth. Demand for organic food is also growing, as is awareness of variations in peoples dietry preferences, so gluten and dairy intolerant or vegetarian/vegan eaters will often find that choices are available in most places, or can be prepared in the kitchens on request. Pub food in QLD is no longer just the sad old counter meal variety, if you find a fairly modern pub you'll find a fairly modern kitchen and while you can often still get lunch for $10, generally the low price won't be reflected in the quality. Breakfast is big in Brisbane and markets are particularly good places to go for a local brekkie. Alternatively, you'll find free and clean public BBQ's in lots of the public parks, so bring your own picnic along and enjoy QLD's gorgeous weather while you cook up your own true Aussie BBQ. To be fair to the other patrons, give the BBQ plate a wipe down after you've finished with some clean newspaper, and place your rubbish in bins provided. How fresh can it get? Straight from the farmer to you is the latest trend and foodies throughout Queensland are loving the range and quality of local seasonal produce. It pays to get up early with the sun, pack plenty of extra bags and don't forget a cold pack in case some divine seafood or meat takes your fancy. Stroll around the stalls and chat to the farmers, once you get past the weather you'll discover a wealth of information about how to select, store and cook your purchases. Brisbane - Head to The Powerhouse at New Farm in Brisbane by at least 7am on a Saturday morning and you'll discover locals armed with trolley bags snapping up high quality produce and seasonal bargains on a regular basis. On the last Sunday of each month the stallholders move to suburban Mitchelton. If organic is your style the Green Flea Community Markets at Davies Park in West End or the Northey Street Organic Market at Windsor will keep you busy. Gold Coast - Foodies are well catered for with the farmers markets at Banora Point, Bundall, The Spit, Miami, Mudgeeraba and Tamborine offering fresh produce. South East Queensland Country - Enjoy fresh food right where it is grown on the Southern Downs at the Glengallan Seasonal Farmers Markets, 15km north of Warwick on the first Sunday of each season. Don't forget to look for fresh seasonal produce across the region on road side stalls. Sunshine Coast - The Noosa Farmers Market on Weyba Road at Noosaville showcases some of the Sunshine Coast's best produce every Sunday from 7am to midday. All products are grown, reared, caught, baked or prepared by the stall holder. You'll find farm fresh fruit and vegetables, breads, cheeses, preserves, seafood, red claw, poultry, beef, lamb, coffee and the chance to swap ideas with local producers. The Eumundi Markets are another food lover's delight with everything from fresh produce to taste sensations you'll find hard to resist. Central Queensland - Keep your eyes open for roadside stalls just off the farm. This area is the fruit bowl of the Coral Coast and supplies chillies, tomatoes and the sweetest of peas to southern states. Mackay - Head for the local showgrounds located in the centre of town for the Mackay Farmer's Market every Saturday morning from 6am at the Showgrounds. This is the best spot to gather all local fresh produce and freshly cut flowers. Tropical North Queensland - Rusty's Markets in Cairns are an experience that should not be missed by market lovers. This is an Asian-type market experience with stalls overflowing with exotic local produce and flowers. Queensland offers visitors some great locations for Dining and Eating. Australian cuisine blends fresh ingredients and uses European culinary traditions and the light touch of Asian seasoning. You'll taste some of the best food in the world and even the most discerning diner will be satisfied. With fresh barramundi, mud crab, exotic crocodile meat, mangoes and macadamia nuts. From bargains at the markets to one-off creations at designer boutiques, there’s a shopping sensation to satisfy. For elite high-fashion labels, beat a path to exclusive shopping precincts in Brisbane, the Gold Coast, and fabulous Noosa on the Sunshine Coast. There you’ll find exclusive boutiques and fashion to die for! For the quirky and the vintage, you can’t go past the markets of Tropical North Queensland and Brisbane. And if trawling through second hand shops for antiques and collectibles is your idea of the divine you won’t be able to resist the quaint hinterland villages of South East Queensland Country. There are a wide variety of quality products on offer in Australia at very competitive prices. When shopping, sightseeing or visiting theme parks on tours, remember you have a choice of where and when to shop. Shop around and compare prices and quality before you buy. As in other countries, some Australian business pay commissions to tour operators and tour guides to bring tour groups to their stores. In some instances the cost of these commissions may be passed on to you, the customer. While this does not necessarily mean prices will be higher than at other stores, you should have an opportunity to visit and buy from other outlets, so check your itinerary for free shopping time and ask for free time if none has been allocated. While you are in Australia you are covered by Australia's consumer protection laws, which require businesses to treat you fairly. All stores must obey these laws. Australia also has specific consumer protection measures for the tourism industry; most of Australia's States and Territories have legislation that requires travel agents, and can provide compensation to travellers should, for example, their travel agent go out of business. Your country also has similar laws that protect your consumer rights and govern the professional standards of travel wholesalers and retailers in your home country. If you are not satisfied with what you have purchased form them, you may wish to contact the relevant government authority for travel and tourism in your home country. Please visit the Office of Fair Trading. The local mass produced Queensland beer is "XXXX", known locally as 'fourex'. The most common glass measure is called a pot, so just about any pub in Queensland will server you a pot of fourex'. 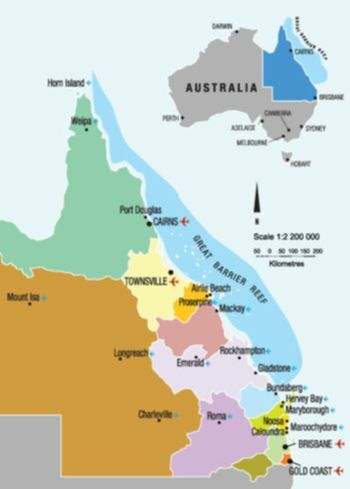 Rum is also produced in Queensland at the central coast town of Bundaberg. It is creatively called Bundaberg Rum, or 'bundy'. The burgeoning Queensland wine industry is one of the state's best kept secrets. Find a cellar door near you, or even a microbrewery to your taste. Queensland offers a gourmet paradise with delectable, award-winning wines, organic produce and fresh seafood. Follow a food and wine trail and you'll be sipping on a Chardonnay or rolling a Shiraz around your mouth on a grape-fuelled adventure. Many accommodation options are available in Queensland for every traveller’s budget. Whether you are looking for a plush five star resort or a cosy Bed & Breakfast thousands of hotels, B&B’s, apartments, resorts and hostels are available to help you find the perfect place for your holiday. Hotels and Motels - range from warm country pubs to swanky high-rises. Every convenience is available at hotels and motels to ensure your holiday spells relaxation. Resorts - luxurious resorts in ideal locations offer comfort and service to world-class standards. Bed and Breakfast -experience the warm welcome and the comforts of home at a Queensland B&B. Self Contained - self-contained apartments, cabins and holiday houses offer all the conveniences of home. Camping and Caravans - camping sites and caravan parks offer the opportunity for you to stay in superb locations, gather with other travelers or relax in complete privacy. Backpackers - backpacker accommodation in Queensland is among the best. Enjoy modern facilities at ideally located hostels. Farm Stay - farmstay accommodation is as down-to-earth as their friendly hosts. Immerse yourself in Queensland's country heritage. Holiday houses are popular in QLD. Check local papers and local internet sites for availability as they are often privately leased and generally modern and clean. The weather in QLD is often excellent for camping, and there are fantastic camping grounds all over the state with a variety of facilities. These include local council's campgrounds, state conservation parks, state forests and national parks. Some national parks require pre-booking but most work on a 'register on arrival' basis. Queensland, Western Sydney, South Australia, and North Territory sees homosexuality as a sin and frowns upon it. Violence towards LGBT occurs and police may turn a blind eye to it. Also discrimination against LGBT is common and laws against it are never enforced. South Australia still has a gay panic defense intended to lower or eliminate punishment for anti-LGBT attacks. LGBT in Queensland, Northern Territory, and South Australia should keep their sexuality private. In general, Brisbane, especially inner Brisbane, and the Gold Coast are probably the safest areas, and the further out from there you go, the less safe it is. LGBT Travelers through the outback of Queensland should be very mindful of their surroundings and ensure they take steps to ensure their personal safety. Queensland Police are not likely to be your friends either. Skin cancer is a serious health issue in Australia, and sunburn and sunstroke are related problems. Make sure you wear SPF 15+ sunscreen, a wide-brimmed hat and t-shirt or long sleeved shirt whenever you can in summer even on cloudy days. Particularly, protect children's skin between 10AM to 2PM, as the summer sun can cause a severe burn that will at best ruin your holiday, and at worst end in a trip to the local hospital. Many media outlets list the UV Index (sun factor) with the weather broadcast. In summer in Queensland expect that the UV Index will be extreme every day. Drink water: most locals carry a bottle of water with them at most times in the summer. The humidity can take you unaware, and dehydrate you quickly. Make sure children take regular drinks if they are playing outdoors, and carry water with you on car journeys, hikes or any time you may inadvertently end up somewhere unexpected. Saltwater crocodiles are common throughout the tropical northern half of Queensland all the way down to Rockhampton. Some people play down the threat to humans posed by the Saltwater Crocodile. The facts are that the Saltwater Crocodile has been protected for decades now and there is a healthy population in northern Australia. It is always best to play it safe as a saltwater crocodile can grow to over 5m in length, and are found both in salt and fresh water. Beaches, rivers, creeks and waterholes can be home to large crocodiles. They are not known to frequent the Great Barrier Reef but instead live in coastal areas and rivers in tropical Australia. Generally, authoritative local advice can direct you to a place to swim which is known to be free of crocodiles or has been cleared of them. When swimming at surf beaches, swim on beaches patrolled by surf lifesavers and between the red and yellow flags. Surf conditions can change quickly, and invisible rips can cause problems for even the strongest swimmers. The flags denote the safest area to swim in and the area is monitored. If you see signs warning swimmers that "stingers" (poisonous animals) are in the water, read them carefully as some are deadly. Find a pool or use one of the net protected beach enclosures common on many main beaches. Queensland Police have a reputation for being more conservative than their counterparts in other Australian states, and some laws exist only in Queensland. It is against the law to wear t-shirts or clothing related to 'bikie' gangs, and there have been reports of innocent individuals being questioned by police for wearing t-shirts that were similar to those worn by bikies. Queensland has many transit routes out of the state for visitors to explore the other areas of Australia. Many highways connect all major cities with most state airports servicing interstate flights.